عاملی, علیرضا, باباگلی, رضوان, کاشانی نوین, محمد. (1396). بررسی و ارزیابی تأثیر افزودنی بنتونیت بر‌خصوصیات خستگی مخلوط آسفالتی گرم. پژوهشنامه حمل و نقل, 14(1), 81-95. علیرضا عاملی; رضوان باباگلی; محمد کاشانی نوین. "بررسی و ارزیابی تأثیر افزودنی بنتونیت بر‌خصوصیات خستگی مخلوط آسفالتی گرم". پژوهشنامه حمل و نقل, 14, 1, 1396, 81-95. عاملی, علیرضا, باباگلی, رضوان, کاشانی نوین, محمد. (1396). 'بررسی و ارزیابی تأثیر افزودنی بنتونیت بر‌خصوصیات خستگی مخلوط آسفالتی گرم', پژوهشنامه حمل و نقل, 14(1), pp. 81-95. عاملی, علیرضا, باباگلی, رضوان, کاشانی نوین, محمد. بررسی و ارزیابی تأثیر افزودنی بنتونیت بر‌خصوصیات خستگی مخلوط آسفالتی گرم. پژوهشنامه حمل و نقل, 1396; 14(1): 81-95. هدف از تحقیق حاضر بررسی و ارزیابی تأثیرات بنتونیت بر خصوصیات خستگی مخلوط آسفالتی گرم است. برنامه آزمایشگاهی این تحقیق شامل استفاده از پنج درصد افزودنی بنتونیت (10%، 15%، 20%، 25% و 30% وزنی قیر) برای اصلاح قیر خالص بوده است. آزمایشهای مختلفی از جمله: مقاومت کششی غیر­مستقیم، مدول برجهندگی و خستگی انجام شده است. آزمایش خستگی براساس تست تیر خمشی چهار نقطه‌ای با سطح کرنش ثابت در سه سطح 600، 800 و 1000 میکرو کرنش با بارگذاری سینوسی انجام شد. عمر خستگی نمونه‌ها براساس کاهش پنجاه درصدی در مدول سختی اولیه ارزیابی شد. نتایج نشان داد، عمر خستگی مخلوطهای آسفالتی ساخته شده با قیر اصلاح شده با بنتونیت بیشتر از مخلوطهای آسفالتی معمولی میباشد. همچنین، بنتونیت منجر به افزایش نسبی مقاومت کششی غیر مستقیم و مدول سختی مخلوطهای آسفالتی گردید. سرانجام، براساس نتایج آزمایشگاهی و با استفاده از رگرسیون خطی لگاریتمی نتایج، مدلی جهت توصیف رفتار خستگی مخلوطهای آسفالتی شامل قیر اصلاح شده بنتونیتی با رویکرد پدیده شناختی تجربی پیشنهاد گردید. The objective of this research study was to investigate and evaluate effects of bentonite on fatigue properties of hot mix asphalt (HMA) mixtures. The experimental program for this study included use of five percentages of bentonite (10%, 15%, 20%, 25% and 30%) by weight of bitumen for modifying base bitumen. Several tests such as: marshal stability, indirect tensile strength, resilient modulus and fatigue test were conducted. The fatigue tests were based on four-point bending test in strain controlled mode at 3microstrain levels (600-800-1000lm/m) with sinusoidal loading. The fatigue lives of mixtures have been evaluated based on the 50% reduction of the initial stiffness modulus. The results show that fatigue life of asphalt mixtures prepared with bentonite modified bitumen is longer than conventional HMAs.Also, bentonite leads to relative increase in indirect tensile strength and resilient modulus asphalt mixtures.Finally, based on experimental results, a model is proposed to describe the fatigue behavior of asphalt mixtures containing bentonite modified bitumen. -خاوندی، ع. و عامری، م. (1393)، "تعیین عمر خستگی مخلوطهای آسفالتی در کرنش­های کم با استفاده از آزمایش تیر خمشی با فرکانس بارگذاری 25 هرتز". مهندسی حمل و نقل، سال پنجم، شماره چهارم، تابستان 1393. ص. 484-494. -زیاری، ح. و عامری، م. و دیواندری، ح. و باباگلی، ر. و کشاورزی، م.، (1391)، "تأثیر افزودنی بنتونیت بر خصوصیات قیر و پارامترهای مارشال"، مجله علمی-ترویجی جاده، پژوهشکده حمل و نقل، شماره 72، پاییز 1391، ص. 241-251. -زیاری، ح. و شادمان بحارینه، م. (1392)، "­ارایه مدل پیش­بینی عمرخستگی آسفالت متخلخل پلیمری با رویکرد پدیده شناختی تجربی" مهندسی حمل و نقل، سال چهارم، شماره سوم، بهار 1392. ص. 221-231. -طاهرخانی، ح. و ابراهیمی مقدم، الف. (1391)، "­پیش بینی عمر خستگی مخلوط­های آسفالتی با استفاده از شبکه­های عصبی". مهندسی حمل و نقل، سال چهارم، شماره اول، پاییز 1391. ص. 45-58. -مدرس، الف. و حامدی، ح. ر. (1393)، "­خصوصیات سختی و خستگی مخلوط آسفالتی اصلاح شده با ضایعات بطریهای پلاستیکی (PET)" مهندسی حمل و نقل، سال پنجم، شماره چهارم، تابستان 1393. ص. 533-546. «­آیین­نامه روسازی راههای ایران (نشریه 234)»، تجدید نظر اول، تهران. -AASHTO, (2006) "Standard Specification for Transportation Materials and Methods of sampling and Testing, American Association of State Highway and Transportation Officials”. -Adhikari, S., Shen, S., & You, Z. (2009). Evaluation of fatigue models of hot-mix asphalt through laboratory testing. Transportation Research Record: Journal of the Transportation Research Board, 2127(1), pp. 36-42. -Ahmadinia E, Zargar M, Karim MR, Abdel aziz M, Shafigh P) 2011(, “Using waste plastic bottles as additive for stone mastic asphalt”. Mater Des; 32:PP.4844–9. -Al-Hadidy, AI. Yi-qiu, T. (2009), “Mechanistic approach for polypropylene-modified flexible pavements”. Mater Des; 30:pp.1133–40. 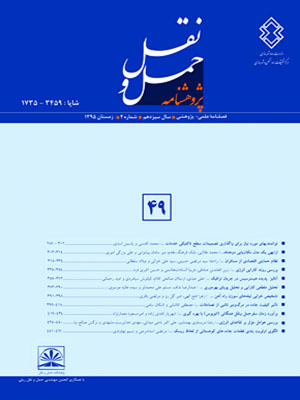 -Arabani, M., Mirabdolazimi, S.M. (2011), “Experimental investigation of the fatigue behavior of asphalt concrete mixtures containing waste iron powder. Materials Science and Engineering A528; pp.3866–3870. -Birliker, RY (1998), “Additives can be added to bituminous mixtures and investigation of behavior of this mixtures and a prediction model for fatigue curve”. Ph.D. Thesis. Istanbul: Istanbul Technical University; [Turkish]. -Colorado Department of Transportation (CDOT), (2009), “Standard Method of Test for Linear Kneading Compaction of Bituminous Mixture”, Colorado Procedure Laboratory 5116. -Daniel, JS., Kim RY (2001), ”Laboratory evaluation of fatigue damage and healing of asphalt mixtures”. J Mater Civ Eng; 13:pp.434–40. - Feipeng Xiao,. P.E Wenbin Zhao, Serji N. Amirkhanian (2009) “Fatigue behavior of rubberized asphalt concrete mixtures containing warm asphalt additives”. Construction and Building Materials 23; pp. 3144–3151. -Ghaffarpour Jahromi, S., Khodaii, A. (2009), “Effects of Nano clay on rheological properties of bitumen binder”. Construction and Building Materials 23; pp.2894–2904. -Gorkem, C., Sengoz, B (2009), “Predicting stripping and moisture induced damage of asphalt concrete prepared with polymer modified bitumen and hydrated lime”. Constr Build Mater; 23:pp.2227–36. -Hicks, R. G., Lundy, J. R., Leahy, R. B., Hanson, D., & Epps, J. (1995), “Crumb Rubber Modifier (CRM) in Asphalt Pavement”: Summary of Practices in Arizona, California, and Florida. NASA, (19980011594). -Khodary Moalla Hamed, F. (2010), “Evaluation of fatigue resistance for modified asphalt concrete mixtures based on dissipated energy concept (Doctoral dissertation, TU Darmstadt)”. -Khodaii, A., Mehrara, A. (2009), “Evaluation of permanent deformation of unmodified and SBS modified asphalt mixtures using dynamic creep test”. Constr Build Mater; 23:pp.2586–92. -Monismith, C. L., Epps, J. A., & Finn, F. N. (1985), “IMPROVED ASPHALT MIX DESIGN (WITH DISCUSSION)”. In Association of Asphalt Paving Technologists Proc (Vol. 54), pp. 347–406. -Ozen, H. (2011), “Rutting evaluation of hydrated lime and SBS modified asphalt mixtures for laboratory and field compacted samples”. Constr Build Mater; 25:pp.756–65. -Perviz, A, tacettin G. (2007), “Influence of carbon black on the mechanical and electrical properties of asphalt mixtures”. Indian journal of engineering and materials science, Vol.14, October, pp.­ 358-364. -Liu, Q., Schlangen, E., van de Ven, M., van Bochove, G., & van Montfort, J. (2012), Evaluation of the induction healing effect of porous asphalt concrete through four point bending fatigue test. Construction and Building Materials, 29, pp.­ 403-409. -Roque, R., Birgisson, B., Zhang, Z., Sangpetngam, B., & Grant, T. (2002), Implementation of SHRP indirect tension tester to mitigate cracking in asphalt pavements and overlays (No. WPI 0510755, Final Report). -Rubber Manufacturers Association (RMA) (2006), “US scrap tire markets 2006 edition. Rubber Manufactures Association”, Washington (DC). -Santiago, F., Mucientes, AE, Osorio, M., River, C. (2007), “Preparation of composites and Nano composites based on bentonite and poly (sodium acrylate). Effect of amount of bentonite on the swelling behavior”. EurPolym J; 43: pp.1–9. -Utracki LA (2004), “Clay-containing polymeric nanocomposites”, vol. 1. RapraTechnology. -Van Dijk, W., & Visser, W. (1977), “Energy Approach to Fatigue for Pavement Design. In Association of Asphalt Paving Technologists Proc (Vol. 46). -Wang, LB., Wang, X., Mohammad, L., Wang, YP. (2004), “Application of mixture theory in the evaluation of mechanical properties of asphalt concrete”. J Mater CivEng; 16:pp.167–74. -Xiao F, Amirkhanian SN, Juang HC (2009), “Prediction of fatigue life of rubberized asphalt concrete mixtures containing reclaimed asphalt pavement using artificial neural networks” J Mater CivEng; 21(6):pp.253–61. -Xiaoming, Liu., Shaopeng, Wu., Qunshan, Ye., Jian, Qiu., Bo, Li. (2008), “Properties evaluation of asphalt-based composites with graphite and mine powders”. Construction and Building Materials 22; pp.121–12. -You, A., Buttlar, WG. (2004), “Discrete element modeling to predict the modulus of asphalt concrete mixtures”. J Mater CivEng; 16:pp.140–6. -Yilmaz M, Kok BV. (2009) “Effects of ferrochromium slag with neat and polymer modified binders in hot bituminous mix”. Indian J Eng Mater S; 16:pp.310–318. -Zare Shahabadi, A., Shokuhfar, S., Ebrahimi Nejad. (2010), “Preparation and rheological characterization of asphalt binders reinforced with layered silicate nanoparticles”. Construction and Building Materials; 24:pp.1239-1244. -Ziari, H., Divandari, H., Babagoli, R., & Akbari, A. (2012), “Influence of bentonite additive on bitumen and asphalt mixture properties”. World Academy of Science, Engineering and Technology, 68, pp. 1292-1297.